Situated on 20 acres of land, Tri City Nursery delivers high-quality large caliper trees, shrubs, perennials and annuals to retailers, contractors and wholesalers across Utah, Colorado, Idaho and Wyoming. Tri City’s previous inventory process required 8-10 people hand-counting trees, bushes and shrubs which range in size from five- to 25-gallon pots. Inventory counts were noted on paper and later entered into the computer system manually. To improve productivity and efficiency, Tri City Nursery moved away from pads and paper and implemented a mobile computing inventory solution to keep a current count of every item on their lot. Working with Automated Office Systems, Tri City Nursery chose Janam XP20s running Counterpoint software from Radiant Systems with a Magic software interface that easily runs on the Palm OS. The software handles Tri City’s inventory management and retail operations. 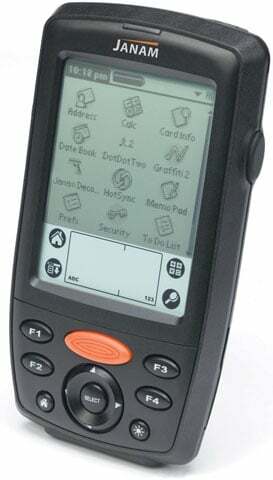 The Palm OS-based Janam XP20 was chosen because of its barcode scanning capabilities, compact form factor and durability in tougher climates. Today, Tri City’s inventory control process is fully automated and expeditious. To keep an accurate count of every item on the farm, each tree, shrub, bush, perennial and annual is tagged with a barcode. This contains all relevant information, including price, description and location. Using the XP20’s stylus, the employee taps the screen to choose a section of the lot and begins to scan the tagged items in that area for an accurate count. At day’s end, the Janam XP20 is returned to the cradle, and data is synchronized to the company’s inventory control system. Overall, this mobile computing solution reduces the number of Tri City staff needed, from the previous 8-10 person workforce down to one or two employees. It also cuts the time in half, to two weeks from a month. Barcode scanning – Janam XP20 delivers high-performance scanning and reliably captures data from the wraparound tags located on various sizes of trees, shrubs and bushes, enabling rapid inventory taking. Compact form factor – The Janam XP20s are lightweight, have a highly visible screen in both sunlight and shade, and a backlit keypad. Durability – Janam XP20s withstand tough environments and can handle the occasional drop in the mud and unpredictable weather conditions. Battery – The Janam XP20’s have a long battery life which is good for a full day’s work, and the rechargeable batteries help to simplify daily usage.